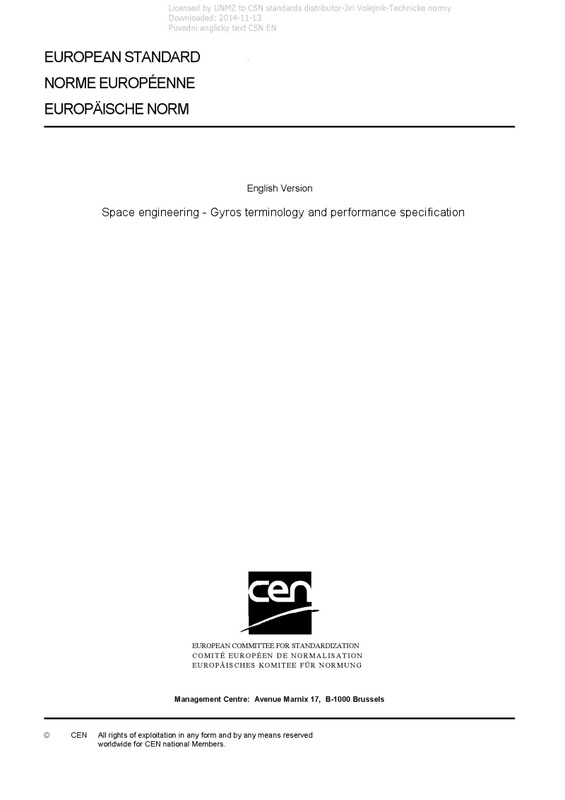 EN 16603-60-21 Space engineering - Gyros terminology and performance specification - This Standard specifies gyros functions and performances as part of a space project. This Standard covers aspects of functional and performance requirements, including nomenclature, definitions, functions and performance metrics for the performance specification of spaceborne gyros. The Standard focuses on functional and performance specifications with the exclusion of mass and power, TM/TC interface and data structures. When viewed from the perspective of a specific project context, the requirements defined in this Standard can be tailored to match the genuine requirements of a particular profile and circumstances of a project. The requirements verification by test can be performed at qualification level only or also at acceptance level. It is up to the Supplier, in agreement with the customer, to define the relevant verification approach in the frame of a specific procurement, in accordance with clause 5.2 of ECSS-E-ST-10-02. The present standard does not cover gyro use for launch vehicles. This standard can be tailored for the specific characteristics and constraints of a space project in conformance with ECSS-S-ST-00.